Bootstrap is a CSS, HTML and JS framework for developing the web applications with less effort. This framework emphasis on developing mobile web applications. Mobile Support: It provides full support to mobile devices in one single file rather than in different file. It supports the receptive design including adjusting the CSS based on the various types of device, size of the screen, etc. It reduces extra effort for developers. Browser Support: It supports all the common browsers like Firefox, Safari, Opera, IE, etc. 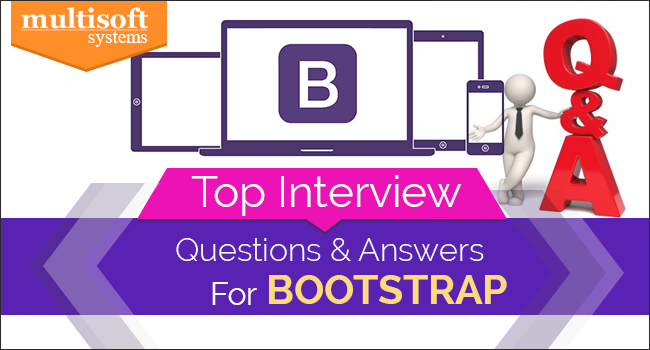 Explain what is Bootstrap Grid System? Offset columns are used for more specialized layouts. For more spacing they can be used by pushing column over. The function “.container” is used to wrap a page content and using that you can also center the content. Explain what pagination in bootstrap is and how they are classified? Explain what are the steps for creating basic or vertical forms? A modal is a child window that is covered over its parent window. Using a custom Jquery Plugin, Bootstrap Modal is created. To improve user experience and to add functionality to users, modal windows are made with the help of Modal plugin. Explain what is a Bootstrap collapsing element? Explain what a list group in Bootstrap is and what is the use of it? To add badge to list group in Bootstrap you have to simply add <span class = “badge”> within the <li> element. Explain what media object in Bootstrap is and what are their types? Bootstrap provides several options for styling navigation elements all of them use the same markup and base class .nav. Explain what is the use of Bootstrap Carousel plugin? Nice Set, Looking for higher version of Answers.